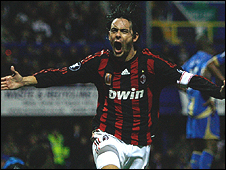 Filippo Inzaghi struck a late equaliser to break Portsmouth's hearts and send AC Milan into the Uefa Cup's last 32. Inzaghi hit the post and the bar early on, while Peter Crouch was guilty of missing three excellent chances. Younes Kaboul headed in Glen Johnson's pin-point cross to put Pompey ahead and Kanu doubled the lead from close range. Inzaghi hit the woodwork again with a diving header, before Ronaldinho scored with a superb free-kick and Inzaghi's injury time toe-poke snatched a draw. Talk before the game had been that Milan were not relishing the prospect of a wintry evening at Fratton Park. And it looked like Portsmouth were going to pull off a famous victory until Inzaghi's late, late intervention. Not that anyone could really begrudge the striker his reward for a performance of real menace. The former Italy international almost opened the scoring when he latched on to Andriy Shevchenko's free-kick, sending a left-footed shot against the foot of the post. Inzaghi hit the woodwork again when he raced on to Gennaro Gattuso's pass and lofted the ball over David James and against the top of the bar. In between those chances for Milan, Crouch should have done better when volleying horribly off target after being picked out by Kanu's cross into the box. It was to be the story of the night for Crouch, who later headed back into the box with the goal gaping, sent a diving header wide and mistimed an overhead kick. Pompey, though, were at least creating chances and certainly did not look overawed. Following a slick passing move, they fashioned another opening, but the angle proved too tight for Glen Little to get his volley on target. Aside from a couple of long-range efforts from world player of the year Kaka, Milan were unable to threaten. And it was no great surprise when Pompey broke the deadlock though Kaboul, who rose between two Milan defenders to thump home a header. Nine minutes later, the home side doubled their lead - and again it was Johnson who was the provider, this time sending in a cross for Kanu to convert. Beardsmore, you can't believe it now! But rather than folding, Milan came back strongly, with Inzaghi denied once again by the frame of the goal from a diving header. On came Ronaldinho, who quickly made an impression when he curled in an exquisite 25-yard free-kick to give Milan a lifeline. Luca Antonini went close with a low, skidding shot as the visitors searched for an equaliser, which they got when Inzaghi struck after his sublime first touch set him up to earn his side a vital point. It was a hugely disappointing end for Pompey and their fans, but the club still has hopes of making the last 32. They need to pick up points from their remaining games against Germany's Wolfsburg - away next Thursday - and Holland's Heerenveen to join Milan in the group's top three. "The boys are feeling flat in there. They thought they had won it. But I'm proud of them tonight. "This was the best performance I've seen from us in a long time. And we can still say we are four games unbeaten now, including against Milan. "We are struggling to put teams to bed, but they (Milan) have some excellent players. If you switch off, they punish you. "We can work on picking teams up from set plays but it was a fantastic free-kick. But I was very entertained by my players tonight. "We've given ourselves a chance but we will still have to get over this. The boys are really upset they didn't hang on to win." "Ronaldinho's free-kick changed the face of the game but we almost lost hope. The reaction had to be good and it was, but you don't often get the opportunity from 2-0 down. "We were a little lucky. We played quite well in the first half but it became a bit more difficult in the second half after they took the lead. "Inzaghi deserved his goal. He was unlucky to twice hit a post but we still had to get the break to recover. "(Portsmouth's) performance did not surprise me. I think they can still go through to the third round in the UEFA Cup with us." Portsmouth: James, Johnson, Kaboul, Distin, Belhadj, Little (Mvuemba 66), Diop, Hughes, Traore, Crouch, Kanu (Davis 81). Subs Not Used: Ashdown, Hreidarsson, Pamarot, Wilson. Goals: Kaboul 62, Kanu 73. AC Milan: Dida, Zambrotta, Favalli, Senderos, Antonini, Gattuso (Seedorf 65), Emerson, Flamini, Kaka (Alexandre Pato 74), Inzaghi, Shevchenko (Ronaldinho 74). Subs Not Used: Kalac, Kaladze, Pirlo, Bonera. Goals: Ronaldinho 84, Inzaghi 90+2. 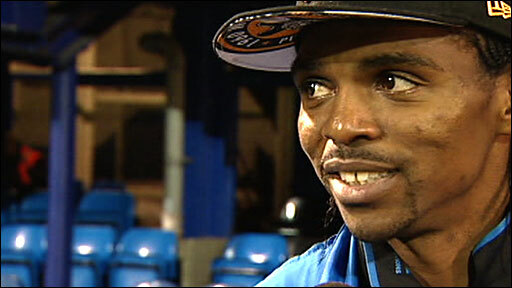 BBC Sport Player Rater man of the match: Portsmouth's Kanu 7.85 (on 90 minutes).